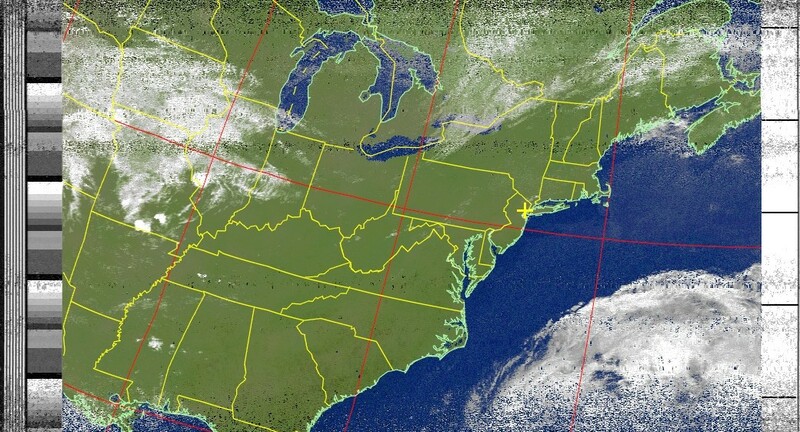 NOAA APT - you want to see the clouds from above? (1) A high sample rate of the SDR (like 3.2 MSPS) is neither necessary, nor advantageous, in fact, I discovered this to be the main reason for some interrupted frames – the data is flowing via USB at 3.2 MSPS, but not all the time. Also, the S/N seems to be better, at lower sample rates, like 0.9 MSPS. (2) The bandwidth. Provided that it is heated-up and left running, the little crystal in the SDR USB stick is actually pretty stable. I need to use a correction value of about 17 kHz at the 137 MHz frequency, but once entered, no need to change so far. Once the frequency is corrected, there is no need to set the FM bandwidth any wider than it needs to be, about 38 kHz seems to do the trick. (3) Volume control. Easy to set, about 70% on the WXtoIMG works fine – I didn’t look at this too carefully at the start – make sure to re-adjust the volume after coming back from other tasks with the SDR USB stick. Not quite perfect, but I can see improvement! Just received some imagery from NOAA-19. Not perfect, but good enough for now. Clear skies above (yellow cross, that’s where I am). Just looked out of the window, confirmed! 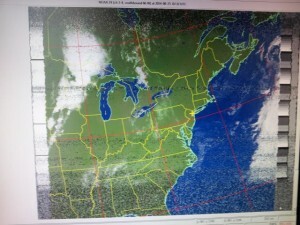 WXtoIMG – that’s the software that you might want to give a try, to convert the NOAA sounds into something more useful. SDRSharp – set to W-FM, 40 kHz bandwidth. It’s just amazing – earlier on, you would need to open up a receiver, do a little mod, etc., to change the bandwidth – unless you had dedicated equipment. Nowadays, just a software setting! Still, I am thinking about getting a good old analog pre-selector into the RF signal chain, prior to the magic USB stick. 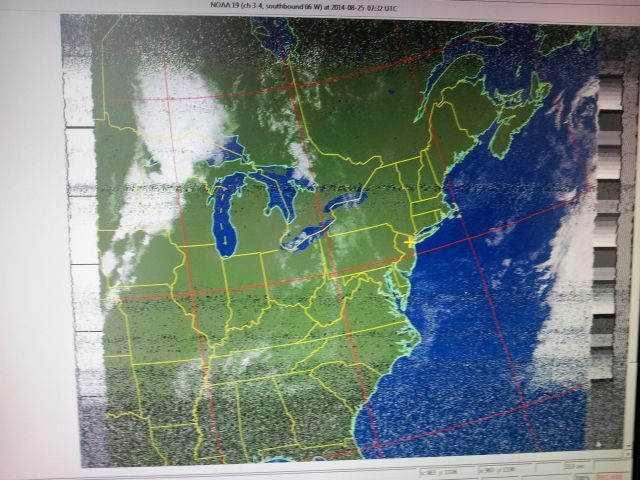 After successful first attempt with a piece of wire – how to improve reception from the NOAA satellites? 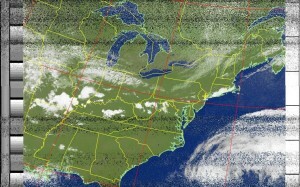 The APT images are sent down at about 137 MHz, with circular polarization. A little search of the web, and it’s pretty clear that there are multiple types of antennas that will work well. 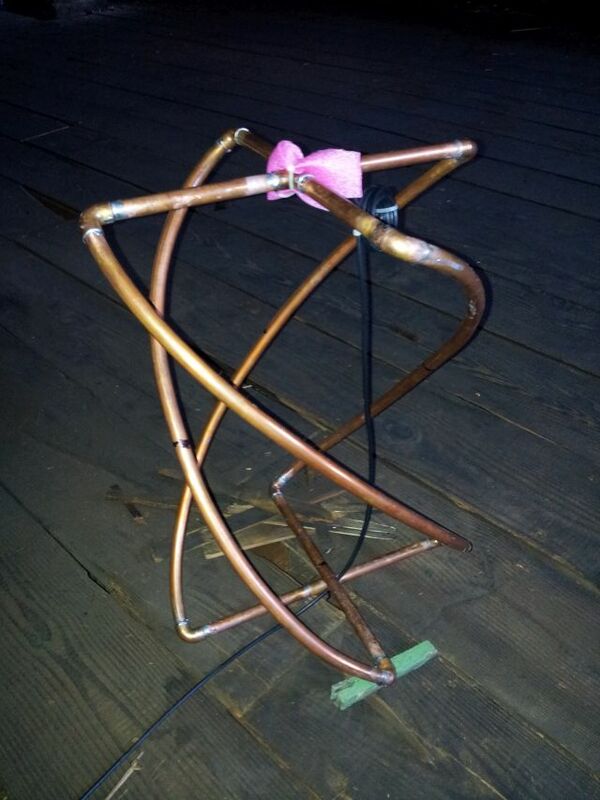 Of course, a fully azimuth-elevation controlled YAGI array would be best, but, no need to get too fancy. 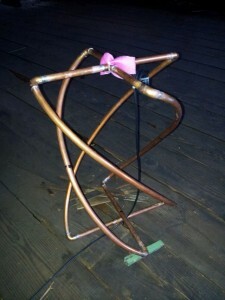 There seem to be multiple, equally suitable approaches – I selected a quad-helix type design, because it’s something that I haven’t made before, at least not, for the 137 MHz band, and would present a little challenge in copper tube bending and soldering. First attempt – well, it looks a bit out of shape, and it is. Still, not too bad, and relatively broadband. (1) Use about 1/2″ (15 mm) outer diameter pipe. This is very strong, and can be used indoors and outdoors, will last a long time. Sure, you can also use 3/8″ or 10 mm, whatever is handy. 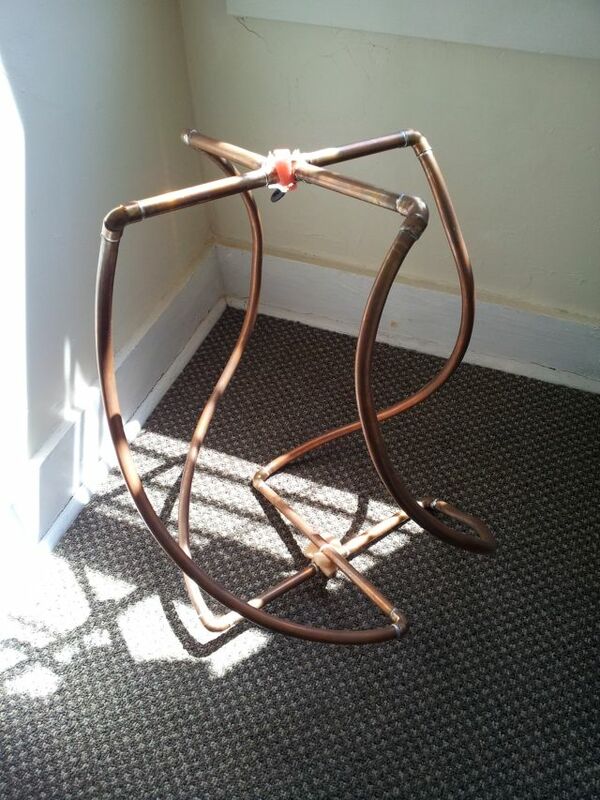 (2) For the straight pieces, best use hard copper pipe, this makes it easier to adjust the loops by some pulling and bending. (3) Don’t worry about complicated baluns. A few turns (5-7) of RG58 coax is all that is needed, at least from my experience. (4) No need to use any special cable, just plain RG58 will do. If you run long length, use a little pre-amplifer. Don’t set the gain too high – just about enough to compensate the cable losses. (5) Soldering doesn’t need to be perfect, because this construction will not need to hold any water. It’s just an antenna. Before we start, satellites are little devices that move through space attracted by gravity, in our case, gravity of planet earth. Some are stationary – they rotate along with the planet’s rotation. Others move in different ways. 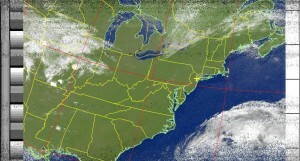 The NOAA satellites, are of the latter kind. Therefore, first step, is to figure out where the NOAA satellites are, and when they are in sight – only then, we can expect a signal. Easy enough. Downloaded “Orbitron” software, which is really great, and updated the “TLE”s – the so-called two line elements that describe the movements of a satellite. Make sure to set your location (and time) right. And get familiar with UTC time scale. APT – this is just the codeword for the downlink protocol. It has been around for a long time, and its days are counted – new satellites use more powerful protocols, more bandwidth, to get high resolution picutures down. But I’m glad there are still a few up that transmit pretty nice pictures, in a not too complicated format. Using SDRSharp and the little Chinese magic “DVB-T” stick, a piece of wire was all that was needed to get some first signal received. So, in fact, there are satellites above. Let’s get a bit closer!